Madeline's deluxe tea set includes a tray, a teapot with lid, four cups and saucers, four plates, four spoons, four monogram patterned blue napkins, and tablecloth, setting the perfect party for four. Each plate features a different illustration from the book. 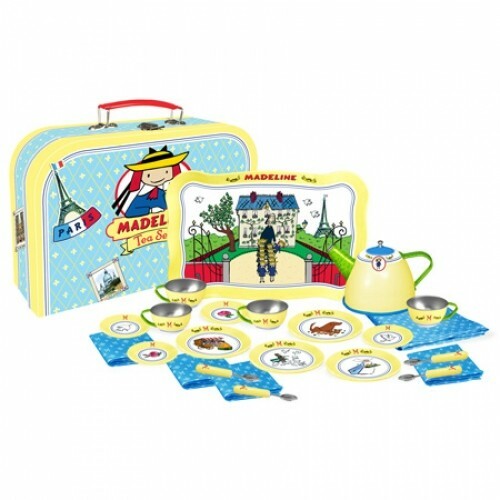 All 23 pieces store securely inside a full-color printed sturdy paperboard suitcase, which is fully decorated inside and out, with a bright red handle and secure closing latch; it boasts the travel stamps of Madeline's favorite international destinations.